This is an authentic chicken satay recipe. 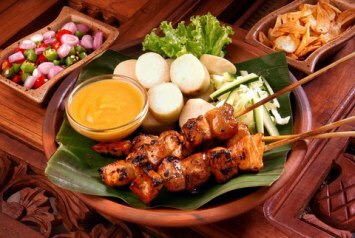 I love chicken satay for its taste and versatility. You can use this satay recipe as an appetizer or a main course with rice and vegetables. This recipe shows you how to make the sauce from scratch. Of course you can always just buy the sauce, but if you want to make it from scratch, here’s how. Pour the boiling water over the coconut. Leave for 15 minutes, then squeeze out. Measure out 1 1/4 cups of the liquid and reserve it. Mix the rest with the marinade ingredients. Cut the chicken breasts and thighs into small pieces. 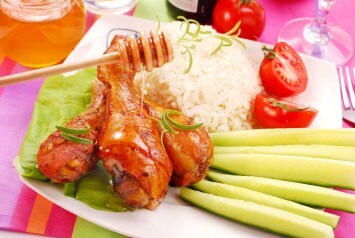 Marinate the chicken overnight in the refrigerator or at least for several hours. Remove from marinade and thread onto wood or metal skewers. To make the sauce, toast the peanuts in a hot oven for 2 or 3 minutes. If your peanuts have the skins on rub them off using a dish towel and then grind the nuts for just a few seconds. Do not reduce the nuts to a powder - this would spoil the consistency of the sauce. Grind or pound the onions and garlic and grind or pound the macadamia nuts and lemon grass. Fry the onion mixture in hot oil, then add the nut and lemon grass paste. Reduce the heat, then add the chili powder and cook for 2 minutes. Add the reserved coconut milk, stirring all the time while. Allow the mixture to come to a boil, then reduce the heat and add tamarind water, sugar, salt to taste and peanuts. Cook for 2 - 3 minutes and stir frequently until the sauce thickens. Broil the chicken skewers for 4 minutes each side under a high heat, then allow to cook for a further 4 minutes each side under a medium heat. Serve with the satay sauce garnished with the chopped green onion. A bit of a shortcut would be to buy the tamarind sauce instead of the tamarind pulp. This is a wonderfully healthy recipe. The herbs and spices in the satay, plus the lemon, ginger, garlic and nuts all add a wide variety of heath benefits. This is a fantastic diabetes recipe. The only thing I would do to make it healthier for diabetics is to cut the amount of brown sugar in the sauce by half, or replace it with something like coconut sugar or stevia. The coconut sugar is a great switch. It is somewhat sweet but much lower in carbs than brown sugar. This chicken satay recipe would be delicious served alongside our sweet and sour vegetable stir fry. Find it here.